Unfunded mandates (off-baseline requirements without money attached) are no fun to deal with, but they may come at you at any time. In project vernacular, call them changes (usually from "the high command") approved by "them", sometimes using the change management process (hopefully, there is a CMP at work for you) and sometimes not. In the event, you can object (and often we do), but usually to no avail ("We have to do this, so find a way"). Was this on the risk register? Likely not; but there you have it, so what's to do? Tax everybody: (In the USA, we call this the 'tea party' approach) Every work package is levied with a small tax to create a reserve to cover the mandate. Usually, this is taxation without representation. Caution: as in Boston in 1773, this approach may engender resistance. WP managers cover the tax by doing the same with less, pushing for economies and gifts of 'free time'. Tap into the the project budget reserves (budget slack). This strategic reserve is supposed to be for the crisis that can't be otherwise resolved. Often, the mandate meets this requirement. Be a rebel: exceed the budget and ask for forgiveness after the fact. This is the "they wanted it, so they got it" approach, but sometimes it works. "Hope is a plan" (and prayer may work also). Just push ahead and hope for a compensating gift from some activity. Frankly, the 'tea party' approach has worked best for me (followed by "be a rebel"). W.D. Cooper. 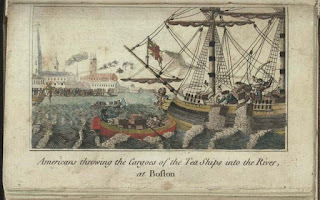 "Boston Tea Party. ", The History of North America. London: E. Newberry, 1789.